This issue of Carolina Planning presents an economic development theme within the context of other community development concerns. An analysis of mobile home zoning policies, solar access rights and the displacement effects of historic preservation are integrated with articles on employment development, strategic planning and arts planning. A digital version of this issue is available here. Major findings of the 1982 North Carolina Task Force on Solar Law are presented. Legal approaches are described, as well as recommendations regarding solar access and land use. This article provides an overview of the strategic planning process as it may be used by local economic development directors. A major arts complex in Winston-Salem, North Carolina is presented as an effective model of economic development planning and public-private partnership. This article highlights sample responses to Southern Growth Policy Board requests for information from Southeastern states regarding policy-program linkages in state government. Mobile homes are described as important alternative to conventional housing. The article raises current restrictions on mobile home siting and urges a revision of discriminatory zoning regulations on the basis of design improvements and relative economic value. The author proposes a variety of legal and financial means of mitigating the adverse impacts of historic preservation in order to better balance their benefits and costs. 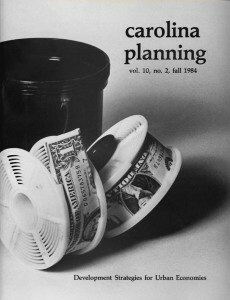 Carolina Planning, the oldest student-run planning publication in the country, is produced once a year in UNC's Department of City and Regional Planning. Articles selected for the journal are written by academics and practitioners, covering a wide range of topics relevant to today’s planning challenges. Carolina Planning is published with the generous support of the Department of City and Regional Planning at the University of North Carolina at Chapel Hill, the North Carolina Chapter of the American Planning Association, and the John A. Parker Trust.